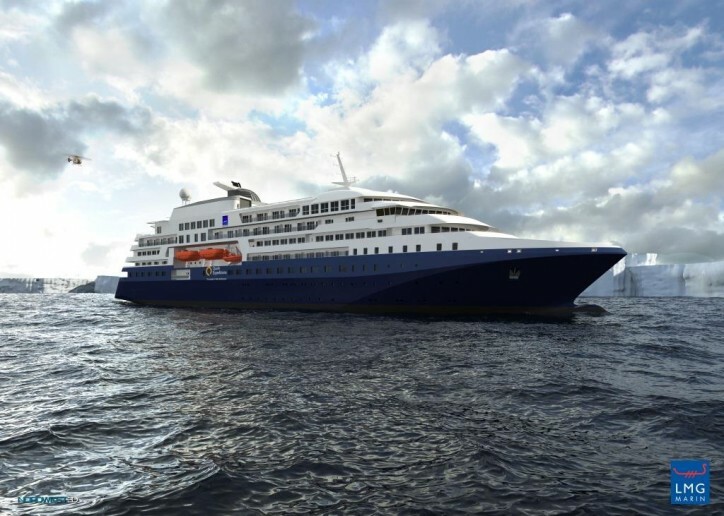 LMG Marin announced earlier today that Quark Expeditions has placed an order for a polar expedition cruise ship of LMG Marin design. The ship will be built by Brodosplit shipyard as their NB487 and is scheduled for delivery by the third quarter of 2020. LMG Marin will deliver a basic design package in a contract with Brodosplit. The vessel, designated LMG 200-PCS, is the result of a close cooperation with Quark and its partners. At 128 m in length, it has a capacity of 200 passengers and 116 crew members. The vessel is tailored for operations in polar and distant regions, and will be built according to DNV-GL polar class PC(6) standard. The vessel will have an unrivaled level of safety and is fully compliant with Safe Return to Port requirements, in addition to having a lifeboat capacity for all persons on board. The polar expedition cruise ship has a strong emphasis on crew and passenger facilities. Excursion boats are stored indoors for safe and efficient operation by the crew. The top deck includes infrastructure for two helicopters that will provide an unprecedented and unique flight experience for the passengers. All passenger cabins have either large windows or a private balcony, with several cabins catering to disabled persons. The vessel is further equipped with a comfortable spa and wellness area, and two restaurants. Passenger ships have always been an important market for LMG Marin. Throughout our 75 years of operation, we have designed more than 100 ferries, RoPax vessels and passenger vessels of various kinds, built at shipyards worldwide. The contract with Brodosplit for Quark Expedition’s new vessel is LMG Marin’s first in the polar expedition cruise ship segment and marks an important breakthrough in our focus on larger RoPax and passenger vessels.